Should I Weatherize My Mobile Home? The short answer is ‘yes’: Mobile homes, especially older models, use a lot of energy and are likely to leak that energy to the outside. Saving energy saves money. Taking weatherization action in your home is a great opportunity to improve your living conditions, place your funds in a high paying investment, and take control of your future. However, it is necessary to be careful about this decision. These fact sheets will help you to understand the mobile home weatherization process: from energy audits to specific insulation techniques. Once you understand what is involved in each step you will need to determine if you or a family member can do the work, or if you need to hire a contractor. The fact sheets offer suggestions as to which steps you might be able to take on without assistance, but your skills, available time, and budget may dictate the steps you take. Are you the owner of the mobile home? If you own the home, then you have a financial interest in improving it. You pay the mortgage and the utilities and are also responsible for repairs and upgrades. Should you sell your home, you will recoup some or all of that investment. Are you the renter of this home? Putting money into improvements will make conditions more comfortable and will lower fuel bills, but may not pay back unless you stay for many years or are able to negotiate benefits with your landlord. (For example, benefits might include reduced rent payments in exchange for home improvements or a longer lease). If you are only staying for a year or two or cannot come to terms with your landlord, then some modest improvements such as switching to CFL lights, replacing furnace filters, sealing big air leaks and installing plastic storm windows make sense. If you have a long term lease or are able to create a mutually beneficial agreement with your landlord, more substantial work may be appropriate. How long do you plan to live in this home? Generally, the longer you plan to live in a home, the larger amount you should invest and the more money you will save from energy improvements. Whether you own or rent, if you only plan to stay in the property for a short time (1-2 years), modest, lower cost improvements will make you more comfortable and may help to reduce energy bills, but larger investments will probably not make economic sense for you. more long term renters, and potentially higher lease rates. Documented energy improvements can now be factored into appraisal comps should you decide to sell the property. Landlords should also consider that they are responsible for health and safety conditions. Often times, the steps taken to improve the energy consumption of the home will also resolve unsafe or unhealthy conditions such as mold and insect infestations and unsafe furnaces. What are Your Primary Concerns and Priorities? Cost of Energy: Do you have problems paying utility bills because of rising cost of home heating? Do you keep the heat down lower than you would like to save on your bills? Do you shut off heat to some rooms to conserve energy? Are you worried about energy costs rising in the future and how you will pay for any increases? The higher your utility bills and the more uncomfortable you are in your home, the more potential there is for energy reduction and financial savings through weatherization. Every region of the country has experienced increases in prices over the past several decades. Energy efficiency measures do require initial investment, but will reduce your utility bills. Physical Comfort: Is your house cold and drafty in the winter and sweltering hot in the summer? Are you physically uncomfortable?The age and condition of your home will influence what and how much you do to your home. Homes built before 1976 (mobile homes) have poor insulation, those built between 1976 and 1994 (called manufactured homes) have substandard insulation, and newer homes have better insulation. Even new homes have some common problems, such as duct leakage and insufficient amounts of ceiling insulation that should be addressed. If you live in an exposed or windy location, your home may be especially vulnerable in the winter time. Air sealing, improving insulation and reducing duct leakage will improve your physical comfort in both summer and winter months. Health and Home Safety: Have you identified rooms or areas of your home that need attention? For instance, does your roof leak? Are there some areas of the home, such as a rotted floor of a hot water heater compartment, or an entry door that badly need repair? Is there mold in back corners? Do you get sick often or have asthma flareups? Are there unexplained odors in your house? Larger Maintenance Issues: As buildings age, they need regular maintenance. If your home has seriously deteriorated, your heating bills may be higher and it might be time for repairs to be made in conjunction with the energy upgrade. Take a look at the windows and doors. Are they showing serious wear and do they leak air? Many home improvements will result in greater energy efficiencies and better living conditions. Problems with equipment: Is the furnace on its last legs? Is the wood stove unsafe? Has your bath fan quit?The age and condition of equipment, like heating systems, can influence your energy bills. The type of fuel that you use to heat your house and the condition of your heating system are also factors. Mobile homes in towns often use natural gas to heat. Rural homes more commonly use propane for heat and hot water. Propane and electric heat are currently more expensive than natural gas or wood, so improvements pay back much quicker. Older furnaces and water heaters are less efficient than new, replacement appliances so equipment improvements can yield fast results in energy savings. What are You Currently Paying for Energy? Making an informed decision about changing your energy consumption means understanding both how much energy you are using and the cost of that energy. To check your use and costs, assemble and review your utility bills to establish your annual expense. Because energy costs vary from year to year, the information will be most helpful if you can assemble 3 years of data. Deliveries of propane and wood can be sporadic, so 5 years of data will give more accurate average annual costs for those fuels. Less information can be used, but your estimate will be less accurate. Often, you can get your energy information by calling your utility or supplier. Take time to understand your utility statements. If you have statements that combine fuels, for example electricity and gas, then separate these amounts. Identify which fuel is used for each activity. Usually, gas or propane are used for space heat and hot water heating. Sometimes cooking stoves use gas too. Space heating costs are largely dependent on weather fluctuations over the seasons. Space heating is addressed with air sealing, insulation, efficient furnaces and turning down the thermostat. Hot water heating, cooking, lights, appliances and electronic use are called “demand load” because they vary with the living patterns of the occupants. These loads generally don’t vary much over the year. Electrical loads are lowered by changing light bulbs to CFLs, by converting to more efficient appliances and by changing behavior. You can reduce hot water use by installing flow restrictors in showers and faucets, taking shorter showers and washing clothes with cold water. Estimate your long term utility costs over 5 and 10 years. Because energy costs have risen over time, it also makes sense to factor in some fuel inflation into your long term estimate. The total amount can be shocking. For example, a $250 fuel bill in January might mean that you spend up to $8,200 over 5 years or $20,000 in 10 years. Depending on how long you plan to live in your home and the amount of money you will spend on your utilities, you can set a reasonable budget for weatherization work. We have a pretty good idea on how much these energy efficiency measures cost too. Many mobile homes have been improved under DOE’s Weatherization Assistance Program, which provide good information on the costs and savings for weatherization measures. 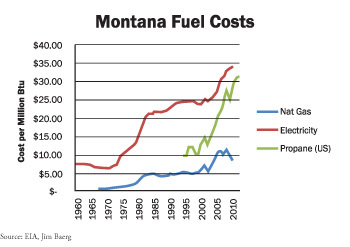 In the Montana program, for example, an investment of $4,500 to $6,500 has resulted in, on average, a 30-35% reduction in utility bills. Sometimes a 50% improvement is possible in very leaky mobile homes. That amount ($4,500-$6,500) of spending, if spent wisely, is generally sufficient to fully weatherize your home. However, other additional measures, like replacing windows, will add to that expense. Use these fact sheets and look for (1) or (2) which indicates measures that can be done by a homeowner. Many measures are relatively inexpensive and easy. Start on these items immediately. Consider habits and lifestyle changes you can make to save energy. Regularly turn off unused lights and turn down the thermostat at night. Wash dishes and clothes when your machine is full instead of doing smaller loads. Place all your electronics on a common power strip. These measures don’t cost money, but require a commitment to energy conservation. Review your skills. Can you commit to doing some of the work yourself? Do you have practical experience with home improvement? Do you have friends or relatives that can help? Assess your available cash. Do you have available credit, or credit cards? Do you have family members who can help? Taking out a loan can minimize your out-of-pocket expenses and the positive cash flow from energy savings can pay off the loan. Be careful though, with debt. Interest rates and penalties hurt your finances if not handled carefully. Consider expenditures from the rest of your budget you could forego to achieve long term savings and comfort. Can you put off a trip or an automobile upgrade? Check incentive programs. Are there funds availablefrom grants, rebates or other programs? In these fact sheets, you will find information on techniques that have been developed and used by weatherization professionals around the country. Many thousands of homes have been weatherized under formal economic and procedural guidelines and have proven that these methods work and pay for themselves. An energy audit is important. It is difficult to identify problems and prioritize measures that are most cost effective without an audit. Use the audit factsheet to better understand this process. The more complete the testing, insulation, and air tightening package, the better. A complete weatherization of your home will yield maximum comfort and pay real dividends, especially if you plan on living in the home more than 5 years. In our experience, 80-90% of all mobile homes (especially the older ones) also need a furnace evaluation and tune-up, and duct sealing. Belly repair and the insulating of floors, walls and ceilings are usually needed on older homes too. Jalousie windows should be replaced but it is rarely cost effective to replace the other windows. You may consider installing interior storm windows if you have single glazed windows.